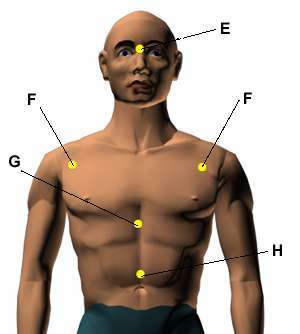 There are the acupressure points for relieving Frustration & Irritations. Working on these points can help you get better quicker. You do not have to use all of these points. Using just one or two of them whenever you have a free hand can be effective. Location: Below the base of the skull, in the hollow between the two large vertical neck muscles, two to three inches apart depending on the size of the head. Benefits: Relieves irritability, headaches, dizziness, arthritis, neck pain, injuries, trauma, shock, and hypertension. 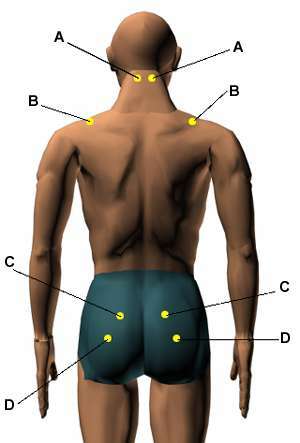 Location: On the highest point of the shoulder muscle midway between the outer tip of the shoulder and the spine. Benefits: Relieves frustration, irritability, fatigue, shoulder tension, and nervousness. Location: Two finger widths outside the widest portion of the sacrum at the level of the hipbone. Benefits: Relieves frustration, irritation, pelvic tension, sciatica, lower-back aches, and hip pain. Location: In the center of each buttock, in back of the most prominent part of the upper thigh bone. Benefits: Relieves frustration, irritation, hip pain, sciatica, lower back pain, and rheumatism. Location: Directly between your eyebrows, in the indentation where the bridge of the nose meets the forehead. Benefits: Good for spiritual and emotional imbalances, and relieves hay fever, headaches, indigestion, ulcer pain, and eyestrain. Location: On the outer part of the upper chest, four finger widths up from the armpit crease and one finger width inward. Benefits: Relieves breathing difficulties, chest tension and congestion, emotional tensions coughing, asthma, and skin disorders. Location: On the center of the breastbone three thumb widths up from the base of the bone. Benefits: Relieves nervousness, anxiety, frustration, irritability, chest congestion, insomnia, and depression. Caution: Do not hold this point deeply if you have a serious illness. It is best not to hold this point for more than two minutes and to use it only on a fairly empty stomach. Location: On the center (midline) of the body, midway between the base of the breastbone and the belly button. Benefits: Relieves frustration, stomach pains, abdominal spasms, indigestion, emotional stress, and headaches.